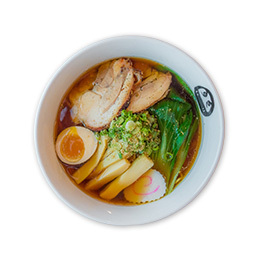 No To-go (or delivery): Ramen is a dish best served in the now! No Reservations or Call Aheads: We are so small it would be virtually impossible to take reservations. Plus we feel it is most fair to remain first come first serve. 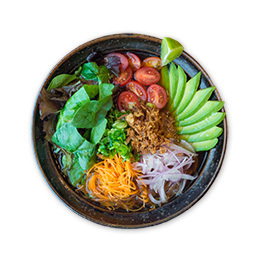 If you're a party over 6, be okay with being split up: We're not trying to come between you & your ramen, but we are trying to make it easier to seat your group when you join us. Please keep your children nearby: We are small, and run-away children tend to dampen the experience for other guests. Also, once again, we're small! So every flailing arm counts. Please no sharing: Once you taste it, you're going to want your own bowl anyway. Do everyone here a favor, and save the Saké Bomb for one of the many bars that are a few blocks over. We hate to see you leave but... there are others waiting. So please be conscious of those that are standing in any of our crazy Texas weather scenarios waiting for their chance to slurp! 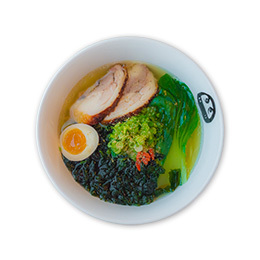 We specialize in whole chicken broth ramen made with eggless tapioca-based ramen noodles. All of our stock and bases are freshly made every day from scratch. Whole chicken broth has many great health benefits such as lower calories, lower cholesterol, and high in vitamins. 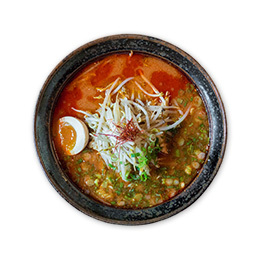 It allows us to make our ramen with a light and delicate flavor that you can enjoy until the very last sip of soup. Our menu is very simple. 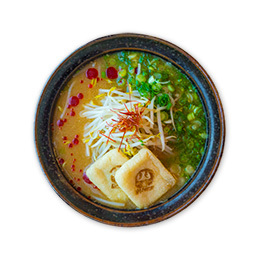 We offer just four varieties of ramen: Shio, Shoyu, Miso, and Vegetable (which is vegan). All four ramens have a very unique personality so you can choose your ramen based on your diet or your craving. Our interior design was done by Richard Weiss. He was able to bring a very cozy traditional Japanese ramen shop ambience with some modern, sophisticated, yet warm, welcoming set up. Small key items: our beautiful chopstick/napkin holders and the exterior signage were crafted by the local wood worker, Brian David Johnson.